Sophia Webster’s typically quirky style is often just a little too quirky for many of my reader’s tastes, but perhaps this classic-pump-with-a-twist will be more to your liking. 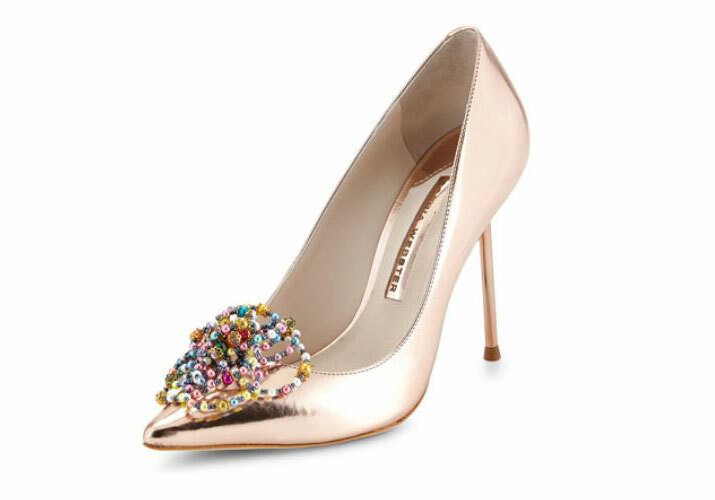 The basic shape of this shoe is one that Sophia Webster releases often, and it’s a winner in my book: curvy, low-vamped, elegant – it doesn’t get much better than that… unless, of course, you add a rose-gold leather upper, and an unusual embellishment, which this shoe has. 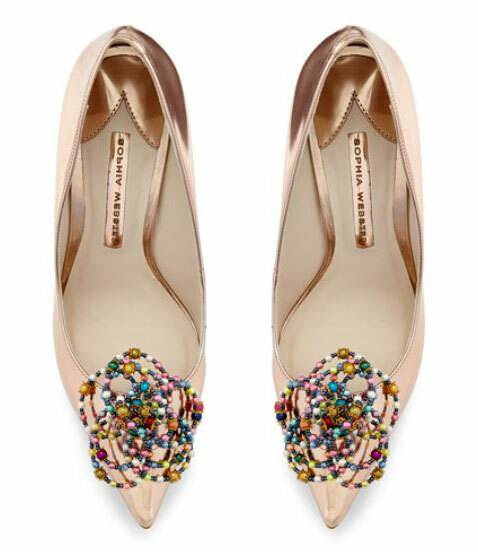 The beaded embellishment is different in all the right ways – it made me look twice, and I think it makes the overall effect more interesting, but it’s not clashing with anything, or competing for attention with all of the other elements of the shoe, as can often be the case with this brand’s designs. I actually think I prefer these to the pumps – they’re a touch more flamboyant, which I like! 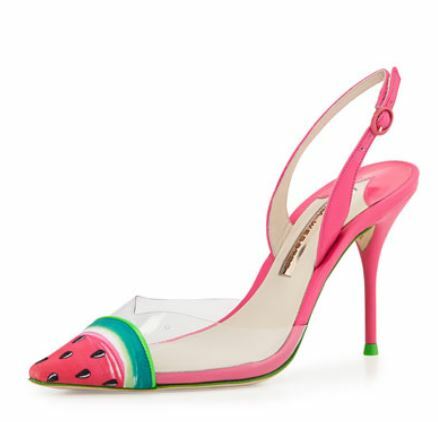 Watermelon slingbacks. I have an extreme aversion to anything approaching the territory of “novelty shoes”, but I’m not gonna lie – I kind like these. Not enough to want to actually buy them, I hasted to add, but I don’t think they’d be quite as tricky to style as some shoes of this description, so at least that’s something! I talked a bit last week about starting to see more platforms in stores again, and here’s another example. These are bright pink, with a chunky platform, a round heel and some over-sized gems on the front – subtle, they’re not. They are, however, a lot of fun – especially if you like pink! YUP! 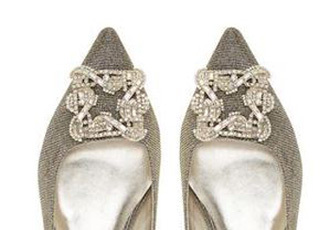 I could really like the metallic pumps if the stiletto heels had better shaping so that the heel tips were not placed more behind the shoe than under. The price would cause most people to revamp their budget priorities for the next month or so, but for a good pair of heels, this is only a formality. Those Monique sandals are lovely!